I will explain using the 2 tier veil length as an example. 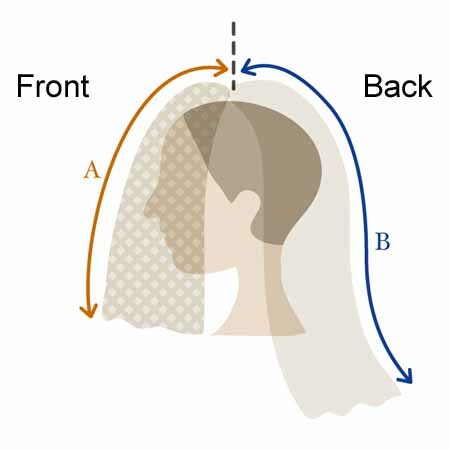 The single tier veil and Maria veil's back side (from the top of your head) are almost the same. The front is about 50-70cm, depending on your height. For example, if you are 150cm tall, it is about 50cm. If you are 180cm tall, it is about 70cm. The veil edge is around the bust line or just slightly longer, but you can choose any lenghth on the front. When you take a measurement from your top head, don't use a straight ruler please. There is gathering on the top, so use a tape measure and take a mesurement of the curve. There are some lengths on the back side (arrow B). These lengths are just a guide and doesn't include a front length. If you are a tall or short person, please adjust the length. Also, if you are makeing a veil that is longer than knee length, can you check your shoe heel size as well. * When you extend your arms by your side, the veil edge should be around your fingertips.